Kids entertainment on a budget? It is possible. How to entertain the kids every weekend in 2016 for only $63. Every single time my children and I leave the house to do something fun it costs us at least $100. Every, single, time. It doesn’t help that there are three of them (kids, that is). All costs are multiplied by three and then if I feed and water them, it costs even more. They are always hungry, and thirsty, even if we’ve eaten just before we’ve left the house. If I get a coffee, well, then it costs $104.50. I need my coffee. There is no way I doing without that. “Watching a movie on TV,” a little less convincingly. And then what? Image via iStock. You can imagine my excitement (yes, I actually get super excited by things like this!) when I found out about a pass that covers heaps of activities we love and then further discovered that it’s actually on sale at the moment. Have you heard of the Premium Merlin Annual Pass? It is an entertainment pass that lasts for an entire year and gives you unlimited access to some of the best destinations, including SEA LIFE Sydney Aquarium, WILD LIFE Sydney Zoo, Sydney Tower Eye, Madame Tussauds Sydney, Illawarra Fly Treetop Adventures and Manly SEA LIFE Sanctuary. And it’s on sale just in time for the school holidays. With 30 per cent off at the moment, the Premium Merlin Annual Pass works out to be just $63 for kids and $83 for adults. You can start out by purchasing a family pass for three people for $189 and then add extras on if needed. It really helps if I don’t have to worry about the cost of everything every time we head out the door. That means our trips are carefully budgeted and planned. Sometimes we even stick to those budgets and plans. Other times I think, stuff it, and I give in and let them choose something from the souvenir gift shop. When we go out we want to enjoy ourselves, not count every dollar and do without. 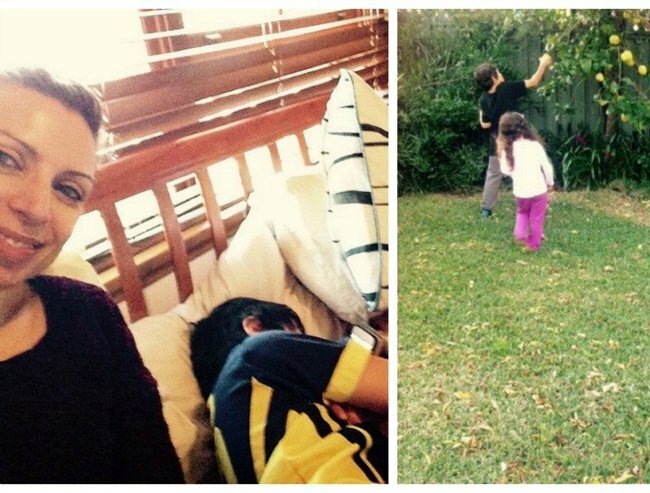 Jo with her kids doing their usual school holiday activities. Image: Supplied. With a Premium Merlin Annual Pass sorted I only have to worry about paying for food, drinks and the occasional incidentals like those gift shops, strategically located at the exit so they are impossible to avoid. Still, I don’t mind. I want my children to enjoy their lives. That’s why my husband and I work so hard. That’s why we spend our money carefully and that’s why passes such as this make so much sense. Our kids are lucky these days, aren’t they? There was nothing like this when I was little and school holidays were spent floating around the house. Occasionally I’d get to visit a friend or have them over. Special outings were family trips to relative’s homes. That was pretty much Oh, actually one time Mum took us to see The Never Ending Story at the cinemas after a particularly harsh trip to the dentist. I can’t remember any other time that we did something like that. Sometimes we’d get a trip to the local pools but for the most part we were left to entertain ourselves. There’s nothing wrong with that. We used to use our imaginations to invent games and have plenty of fun. I’ve just always wanted something a little different for my kids. I wanted them to be able to do more and see more. My kids don’t know how lucky they are, even though I remind them constantly. Being able to visit places like SEA LIFE and WILD LIFE as often as we like is so amazing. I haven’t taken them to Madame Tussauds yet so am really looking forward to that.